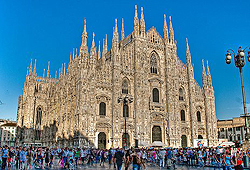 Milan, the capital of Lombardy, is known to the world as the fashion capital of Italy and the home of AC Milan. But there is more this amazing city than fashion and football. Milan was once the capital of the Western Roman Empire, and briefly the capital of the Cisalpine Republic of Napoleon. It was the seat of the highly-cultured Sforza court in the Renaissance era, when great artists and architects left their mark on the city: Bramante, who designed the church of Santa Maria Presso San Satiro; Filarete, who designed the Ospedale Maggiore; and most famously Leonardo da Vinci, who painted The Last Supper and oversaw several city engineering projects. The rule of the Sforza dynasty later gave way to a succession of foreign occupiers. First came the Spanish, who left behind the palazzo that defines the Brera neighbourhood of today. They were followed by the Austrians in 1714. The early Austrian occupation period saw the flowering of opera in Milan; Mozart wrote several operas here, and La Scala opera house was built and played host to many operatic premieres. It was also during this era that the Brera Academy was founded, and such landmarks as the Palazzo Reale and Villa Reale were constructed. In 1796, Napoleon's French army conquered Lombardy, including Milan. The Napoleonic period was brief, and Lombardy was returned to Austro-Hungarian rule in 1815. The Milanese bristled under this later Austrian occupation, until the city all-out rebelled in 1848. Still, the Austrians held on until 1859, when they were driven out. Lombardy then became part of the Kingdom of Sardinia, which in 1861 became known as the Kingdom (later Republic) of Italy. Milan was devastated during World War II, when it was the target of frequent Allied bombings. As a result the city lost a lot of its historic architecture. However, it managed to preserve some magnificent Gothic structures, such as Italy's oldest churches among them the majestic Duomo. Also known as Milan Cathedral, the immense Duomo dominates the historic city centre, where you will delight in such architectural monuments as Castello Sforzesco, Palazzo Reale, La Scala Opera House, and the Milan Stock Exchange. Milan is the financial capital of Italy, and a major centre of Italian business and industry; textile manufacturing, rubbermaking (Pirelli), and financial services thrive here. Until recently, automaker Alfa Romeo had a working factory on the outskirts of the city. After spending some time in Milan, you will find that its citizens are fixated on business and fashion. Locals are always concerned about work and money, and appearing stylish. They wouldn't go to the corner market in sandals; Milanese strive to be well-dressed anytime they go out in public. You can say that Milan is the Italian equivalent of London or New York. Less flatteringly, some critics complain that Milan is grey and soulless compared to Florence, Venice and Rome. Yet Milan is also home to several neighbourhoods of surpassing charm. Navigli, for example, is a more romantic, traditional area largely free of the urban bustle. And Brera, with its narrow cobblestone streets, has a villagelike feel. But if you do wish to get away from the city, you can drive out to Lake Como, Italy's deepest lake. This popular vacation retreat, some 40km north of Milan, is much-frequented by romance-seekers and nature photography buffs. The lake is surrounded by pleasant Italian villas and resort villages, as well as hills and mountains which offer hiking opportunities. Milan is not for the traditionalists, but it has its attractions. It is a city for the fashionable, the sophisticated, and the business-minded. It is a centre for design, media, and education. It rivals Rome when it comes to opera, fashion, trade, finance and industry, and it appears to offer the highest quality of life among all Italian cities. Milan is one of the top 50 cities on Mercer's 2008 Quality of Living survey, where it ranked 41st - the only Italian city in the top 50. Milan actually has three times the total length of canals that Venice has, though it is the latter city that is more famous for them and it is the former who has allowed its canals (their construction supervised by none other than Leonardo da Vinci) to sink into disrepair. Milan is divided into 9 zones: a central zone and 8 others radiating from it.